We found the hotel conveniently located to access Allianz Park by foot, in our case for McCartney's show. It worked very well for our intended use. The room was reasonably ample and clean. It has lots of countertop space, including a table for sitting 4 people, with a kitchen area and assorted hardware and an empty fridge. Air conditioning works very well. The shower area is nice and comfortable. The overall feel of the hotel dependencies (elevator, lobby, etc.) is very clean and nice. Two low points wrt the hotel room. First, the windows are not sound proof. We were on the 17th floor and, even with the street not being too busy, the traffic noise was loud and clear. Second, despite the hardware for making coffee & tea, there was neither coffee (not even instant one) nor tea bags available in the room or the lobby; that was also a major letdown for a short stay. The restaurant area is clear and ample and it did have sound-proof windows. The personnel was very courteous. The buffet was ok, not outstanding but ok. Commercial, whole yogurt was available and the bread selection was good. The cereal selection was not good; there were no oat flakes but only some oat flour or something similar, for instance, and the choices of granola could be better. This is a bit strange, as these things are neither expensive nor perishable after all and the market is full of options. The coffee machine has to be changed. Its choices were not good; there was no cafe latte, for instance, and the cappuccino versions had sugar. At the lobby, there was an area with some food available for purchase (there was no time for a meal, in our case). However, no vegetarian option among the sandwiches (themselves of good quality) was available, which was also hard to understand these days. Parking, in the hotel basement, was convenient. The parking spots themselves were on the small side (I have a Subaru Forester, not a particularly large vehicle) and my wife had to struggle some in and out of the car. Finally, a major letdown was the internet. It worked ok when we arrived in the afternoon but not at all available at night when we returned to the bedroom. Really??... All in all, a good hotel that could easily become an excellent one with some minor adjustments. I first arrive to a room where a party was on-going in the room next door. I had to change. the staff at the entrance does not speak a decent english, impossible to understand or ask anything. The breakfast is good but the rest of the restaurant offering is horrible. please make an effort so the food does not seem just out of the freezer! Fantastic stay - great location - great amenities - great views - great staff! 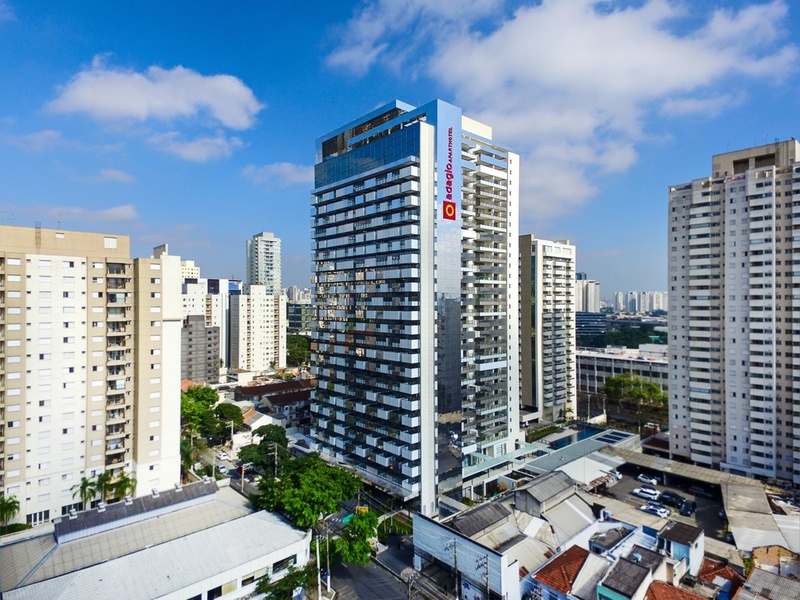 Lovely aparthotel in Sao Paulo. Good location, very safe. Pool is fantastic. Staff was helpful. Friendly staff, good in room amenities and good location. It was nice and the staff are very nice. I usually stay by Ibirapuera but the hotel there was full. I would stay at this location again. This is a nice property. The room was very clean. The room service was good. The location is not far from the airport. The staff is nice. The breakfast was good and reasonable priced. I would stay here again. The wifi worked well. I usually stay at the Mercure by Ibirapuera but it was full. The main thing is the staff were very friendly here. We like th decoration and furniture distribution in the room. Everything was nice and useful. The balcony gets a wonderful spot view of São Paulo. The train and Metro station are so convenient. Amazing location. The region was missing something like that. Pretty new building and facilities. it was so good!!! the bed and pillows were so comfortable and the room was so clean and smelling good! I hope to stay there another time. Everything was so well taken care of. it was a pleasure staying there. fantastic location and central. Everybody was a extremely friendly and helpful. It was cold the week I stayed and although I have requested several times, I never got any blankets. The answer was that they were being washed. Very clean and comfortable infrastructure, spacious but simple installations. It was the best experience in hotels ever. I enjoyed a lot! The staff was excellent. The room was very clean and we loved the view! We want to go back soon..